How cute is this little Christmas cracker that I received thanks to Loreal! The ideal Christmas gift for any girl who loves their locks! 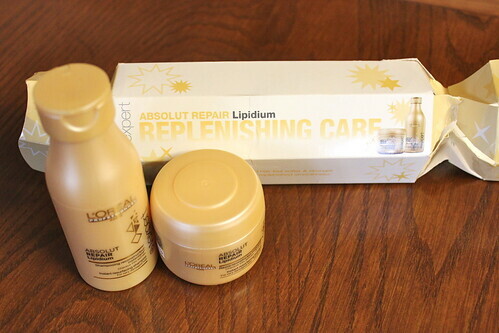 The package consists of resurfacing shampoo and intense treatment cream which is perfect for hair that is feeling the effects of the harsh winter weather. Even though my hair is not on full display in these pictures, you can clearly see that it is gleaming after using the products! It was so shiny and easy to work with and the products left no surface residue whatsoever. If you want to check out the products for yourself, why not visit their website – www.loreal.com or visit your local pharmacies or salons to pick up this little Christmas gift before it’s too late!